Chatbots have become increasingly popular over the past few years, thanks to increased online brand-customer interactions. Not only has the volume of customer queries increased, but, these queries have become more complex. If a business wants to cater to these customer demands round the clock, AI powered chatbots make for the perfect solution. It's cheaper and more efficient than hiring more agents to interact with customers 24/7. RPA stands for Robotic Process Automation; a combination of this and AI enables chatbots to offer intuitive and seemingly natural responses to the most commonly asked questions by customers, making this technology a must-have for any enterprise that wants to provide a more exciting customer experience and reduce errors and inefficiencies that could be caused by human agents. 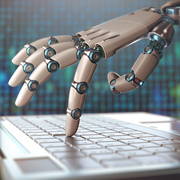 What Does an RPA Do? RPA bots can be programmed to carry out preset tasks which involve processing pre-provided information speedily, recommend solutions, and in certain cases, actually begin the resolution process. The amalgamation of RPA and chatbot technology is a huge blessing especially for finance and insurance companies. For example, in the insurance domain while interacting with RPA bots, customers need to just mention their policy or claim number to get all the information about their insurance policy. It goes without saying that having your own chatbot is going to be the way forward if you want to stay relevant and enjoy a competitive edge. A huge majority of businesses, over 60%, use IBM Watson to build their chatbots. This platform is built on a neural network which has the capability to understand dialogue and intention, thanks to its huge conversation capacity. It has many inbuilt developer tools like iOS SDK, Java SDK, and Node SDK. It supports two languages - English and Japanese. Using this platform you can create bots that are fully conversational, not just answering simple questions. Such bots are capable of guiding customers through the different steps to complete certain processes. All the conversations with customers are stored by Watson, and become the 'notes'; customer data that can be analyzed at any time to gain deeper understanding of customer behavior and preference. This helps make the bot become more efficient in future interactions with customers. If you're looking for simple, cost-effective solutions to create bots that can answer common questions or that can be integrated with virtual assistants and enterprise software, this free platform from Microsoft could be your answer. It allows you to build bots on Azure or locally, and they can be seamlessly integrated with several messaging apps like Slack, Facebook, email, and so on. The bot has the capability of seeing, hearing, and interpreting interactions with humans (customers) thanks to Microsoft Cognitive Services. In addition to understanding speech and voice modulation, Microsoft bots have the ability to recognize photographs, translate languages, recommend stuff, and even to regulate content. Say hello to Alexa's brother! This platform makes use of almost the same technology for deep learning that Alexa does. Lex leverages natural language comprehension and automatic speech recognition to transform speech into text, and also to identify the intent, leading to the creation of a realistic conversation experience. Amazon Lex is ideal for developing bots for transactions, device control, information provision and enterprise productivity. It has a very simple console, and is therefore easy to develop, test, and deploy your chatbot. It is a wholly managed service, and you can just scale as your business grows without worrying about adding more hardware or infrastructure. You also get both support and protection as it has inbuilt integration with the AWS platform. From search engine giant Google, Dialogflow is a chatbot tool that makes use of advanced natural language processing technology to provide excellent text and voice options. Services are available across 14 platforms with a single click, making it one of the simplest chatbots to deploy. Dialgflow agents are integrated with client apps, and help to handle the conversation and direct its flow to make it appear natural to the customer at the other end. You can also build on top of these agents to develop a tailor-made interface, enabling the technology to scale and transform according to the demands of a business at a given time. However, this platform requires some serious coding skills, so we would advise you to go for this if you've got the chops in place already. Intelligent bots from Oracle enable you to create a very natural interface for conversation. You can also integrate this across numerous messaging apps, websites, digital voice assistants and of course mobile apps. Oracle bots maintain conversational context through the combination of complex machine learning and intent detection. They extend functionality of the back-end and provide a personalized experience, and they are easily scalable - so you need not worry about adding on expensive hardware to deliver enterprise solutions for your growing business. The Oracle bots have the capability to provide resolutions to external B2C issues as well as internal issues. Another advantage offered by this platform is the inbuilt analytics; this enables businesses to gain valuable insights into not only the customer behavior, but also the performance of the bot itself. Considering that this is a Facebook bot, it will be no surprise to you that it enables the development of apps that can respond to both spoken and written queries, as well as bots that are capable of interacting with actual people through messaging apps. Wit makes use of NLP to understand what users say, and extracts the necessary info to take the requisite action. Though it is most ideal for developing simple B2C bots, it has proved its mettle across various businesses for the creation of virtual assistants, as well as bots that need to be integrated with IBM services. Having served diverse businesses and industries for a multitude of requirements ranging from website development to creating AI-powered apps, we at Outsource2india have immense expertise and experience. We are an ISO certified company, and have teams specialized in mobile development, software development, CPA, data science, which can meet any customized development requirement. Our AI app team is passionate about creating innovative solutions that will help you provide your customers with an enhanced buyer journey, and a delightful experience overall. We pride ourselves at staying on top of trending technology, and make sure that we equip ourselves with the requisite skills and knowledge. Depending on the specific requirements of your business, we will determine the best option with which to build your chatbot. In this business scenario, you cannot afford to lag behind technologically. Contact us to learn how we can help you get a jump start over your competition with a dedicated chatbot.